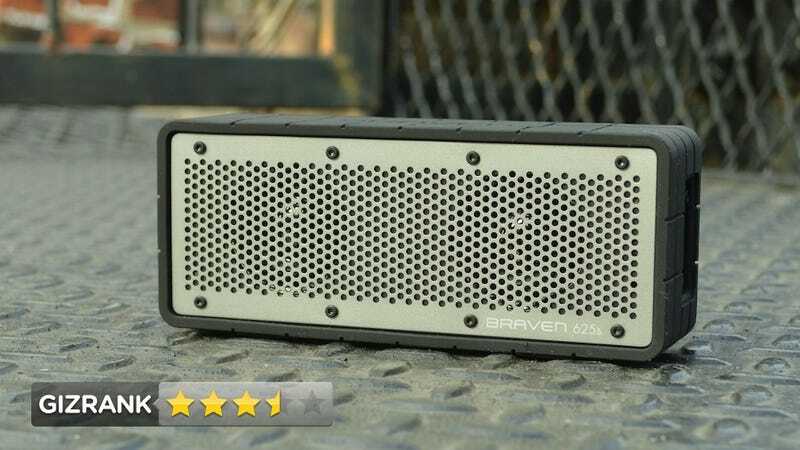 The Braven 625s is a tiny block-o-sound similar to Jawbone's popular Jambox. It's cute, portable, and wireless. It sounds decent, and it's cheap. Actually, the Braven 625s is even cheaper than the Jambox. Plus, it adds convenient USB charging. Is the 625s a better buy? A $180 portable Bluetooth speaker. Folks who want to rock a hotel room or take tunes to the park. A rugged metal grille and a durable rubber case make it a tough travel speaker. The short side has inputs including a USB port, 3.5mm input and output, volume controls, a pairing button, and a mini-USB port to charge the speaker. Outdoorsy customers get a bright yellow, water-resistant carrying bag, and a little USB-powered flashlight. Set a phone or computer to be "discoverable," push the pairing button on the speaker, and you're ready to go. The speaker's onboard volume controls work independently from the source—for the best sound at high volumes, set the source to about 3/4 of its maximum and then crank the speaker all the way up. The speaker's 3.5mm jacks accept a non-Bluetooth audio source or connect an additional speaker. The USB port uses the 625s battery to charge a gadget. Setting it up to play music is a piece of cake. It's a Bluetooth speaker, and a tiny one at that. It's no replacement for an actual stereo. The little flashlight, as if you'd rely on your emergency speaker when the lights go out. • Tested on an iPhone and a MacBok Pro, the 625s got loud enough to comfortably fill a large living room. The speaker projects very well, and it sounds best from about five feet away. • The speaker paired with a device in seconds, every time. • It stays connected even when you're far enough away that you can't hear it any more. • It's a small, low-power package, so the sound's a tad thin, and you lose detail in the music. But overall, everything from hip hop to rock sounded perfectly acceptable, and the audio held up better than it usually does over Bluetooth. • Battery life is specced at 16 hours. It never died during the test. • Gotta love gadgets that can charge other gadgets. Yes. It's cheaper than the Jambox for basically identical sound quality, with better connectivity and battery life. Braven makes a less expensive, bare aluminum model 600—go for the 625s, though, because the rugged casing is worth it.